Microbial Diversity in the Genomic Era presents insights on the techniques used for microbial taxonomy and phylogeny, along with their applications and respective pros and cons. Though many advanced techniques for the identification of any unknown bacterium are available in the genomics era, a far fewer number of the total microbial species have been discovered and identified to date. 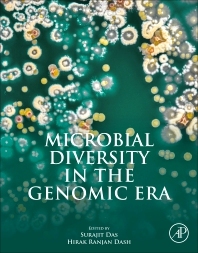 The assessment of microbial taxonomy and biosystematics techniques discovered and practiced in the current genomics era with suitable recommendations is the prime focus of this book. Dr. Surajit Das is an Associate Professor in the Department of Life Science at the National Institute of Technology, India. Dr. Hirak Ranjan Dash completed his Ph.D. from Department of Life Science, National Institute of Technology, Rourkela, India and currently working as Scientific Officer (DNA), Forensic Science Laboratory, Sagar, Madhya Pradesh, India. He did his M.Sc. Microbiology from Orissa University of Agriculture and Technology, Bhubaneswar, Odisha, India. His research interests include molecular microbiology, microbial bioremediation, marine microbiology, microbial phylogeny, genetic manipulation of bacterial systems and microbial diversity. He has developed a number of microbial techniques for assessment of mercury pollution in marine environments. Discovery of a novel approach of mercury resistance i.e. intracellular biosorption in marine bacteria has been reported by him. He has successfully constructed a transgenic marine bacterium for enhanced utilization in mercury removal by simultaneous mercury volatilization and sequestration. He has also worked in the field of genotyping and antibiotic resistance mechanism of pathogenic Vibrio and Staphylococcus spp. He has written 1 book and published 18 research papers, 7 book chapters and 10 conference proceedings in his credit.